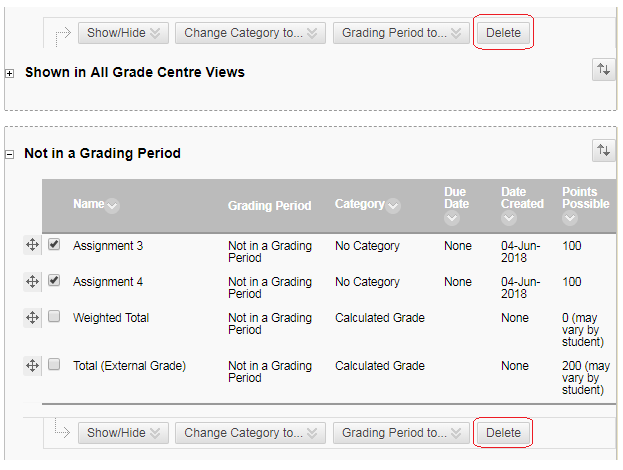 Follow this guide to delete multiple Blackboard Grade Centre columns at once. Note that deleting a column will remove any results, scores, or data associated with that column. If columns are deleted the data within them cannot be recovered. You should therefore use this tool with caution. 3. Tick the box beside the column/s you wish to delete. 5. 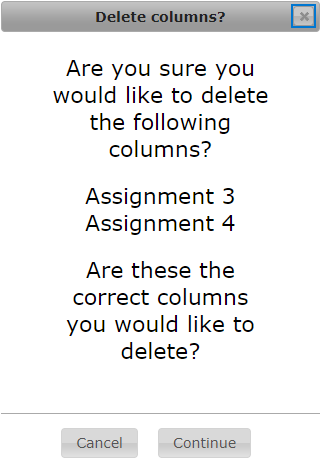 You will be asked to confirm that you wish to delete the columns. 6. A further warning will be shown. Click on Delete only if absolutely sure that you wish to remove the columns and all data held within them. 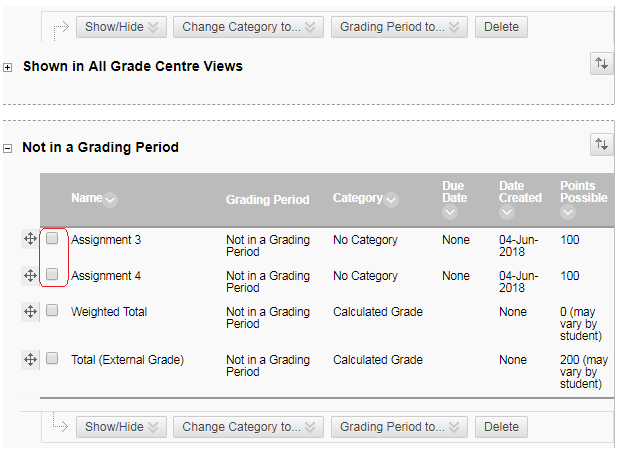 The Blackboard Grade Centre can use “Smart Views” to help you to filter the Grade Centre screen to only see certain users. It is possible to create a Smart View based on a Blackboard course group’s member list while creating the group, but it can also be done at any other time by following the instructions below. 2. You are presented with a list of the groups set up on your course. 3. 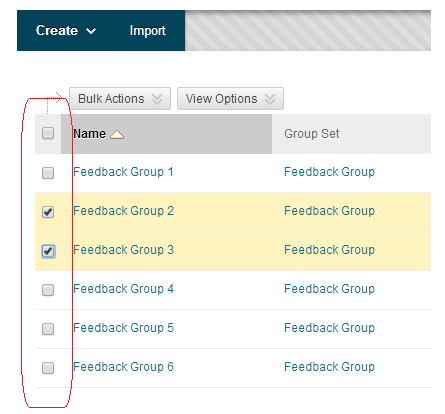 Place ticks in the tick boxes beside any groups for which you wish to create Smart Views. 4. 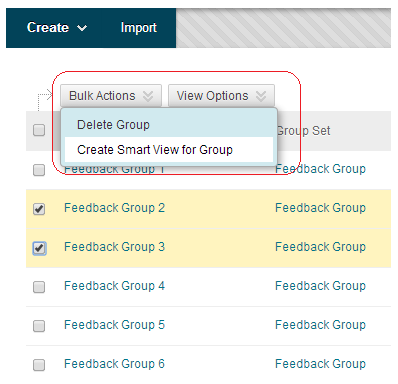 Hover your mouse pointer over the Bulk Actions button and choose Create Smart View for Group. 5. You will receive a confirmation message at the top of the Groups box. If you wish to download your course’s Grade Centre, or a part of it, follow these instructions. 1. 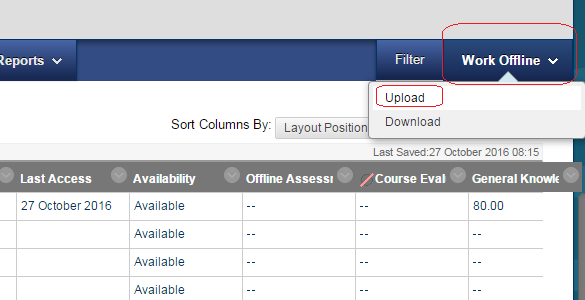 From your course Control Panel, access the Grade Centre. 2. Hover your mouse over Work Offline and choose Download. 3. Choose which parts of the Grade Centre you wish to download. 4. For delimiter type choose Tab. 5. If you do not wish to include hidden information choose No, otherwise leave it set to Yes. 8. Click on Open to open the file, or on Save to save the file to your computer. Blackboard tests and survey results are automatically recorded into the Blackboard Grade Centre. The Blackboard Assignment feature makes use of the Grade Centre for downloading submissions and entering marks and feedback. The Grade Centre provides reporting functionality, allowing you to generate printable reports. This guide explains how to manually enter a grade. This guide explains how to manually enter a score and feedback. This page lists current known issues with the Grade Centre. 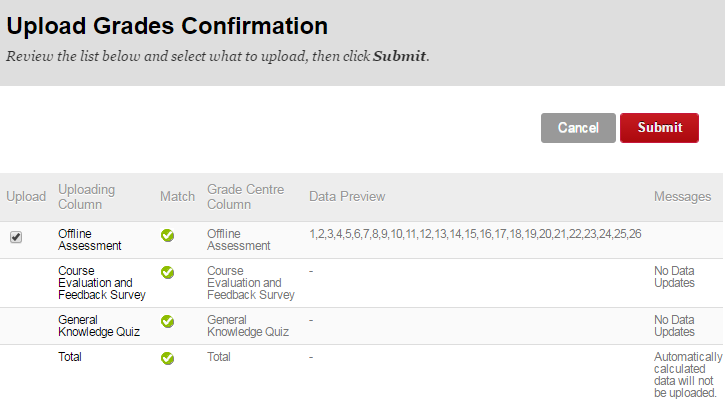 By default the Grade Centre will show all students in your course. Smart Views allow you to customise this so that you can focus on certain groups of students. 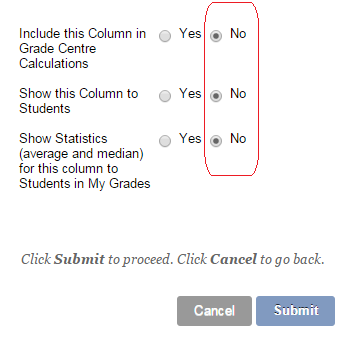 You may organise the Grade Centre so that columns are shown in your preferred order. 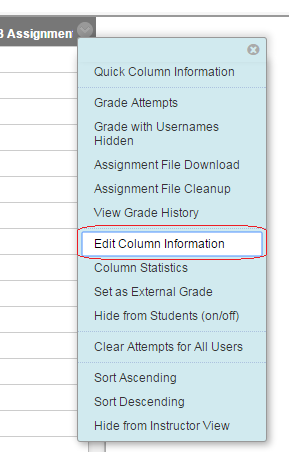 This feature also allows you to quickly change the grading periods and categories of columns within the Grade Centre. Usually you will be using the Interactive View of the Grade Centre. However if you have accessibility issues with using the Grade Centre you may wish to change to the Non-interactive View. If you wish, you may add an extra column to the Grade Centre to record scores that are not usually held within Blackboard. If you wish, you may add an extra column to the Grade Centre that will show the results of a calculation based on scores from existing columns. It is possible to create categories and assign Grade Centre columns to these for simpler management of the Grade Centre. The Grade Centre allows you to set up Marking Periods. These are periods of time to which grade columns may be associated. 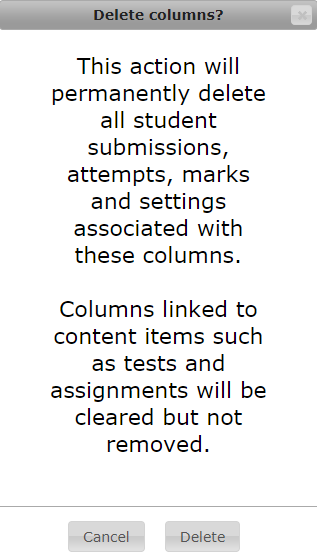 For example Marking Periods could be set up for each semester to differentiate assessments between semesters. Grading schemas allow you to associate certain values with numerical scores. For example one course create a pass/fail schema, where any score below 40 is shown as a fail. If you wish to delete several Grade Centre columns at once you can do so by following this guide. Note that deleting a column will remove any results, scores, or data associated with that column. If columns are deleted the data within them cannot be recovered. You may export the Grade Centre to a file which you may open in Microsoft Excel. 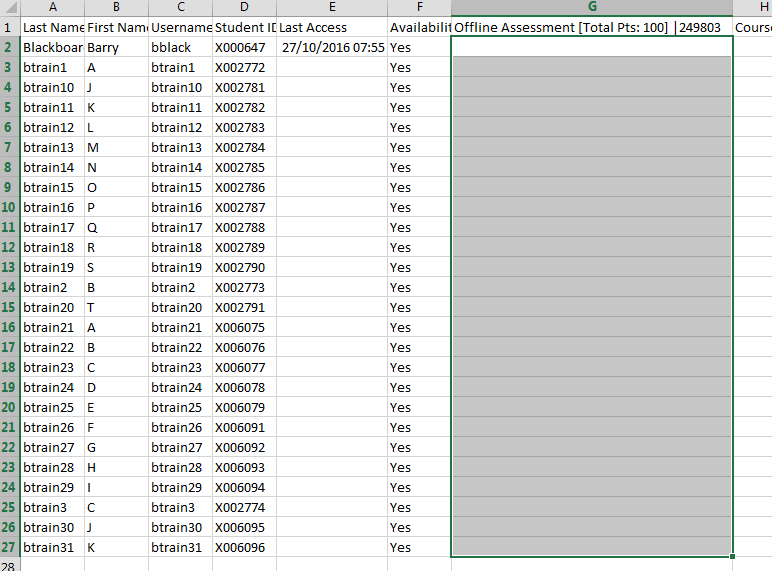 This will export student details, Grade Centre columns, and scores. You may upload marks from an Excel file into the Grade Centre. The Grade Centre keeps a record of whether Grades are changed, and if scores were changed it is possible to view the previous score. The Blackboard Grade Centre keeps a record of the history of a grade. 1. First we will look at how to identify the history of an individual grade. 2. Place you mouse pointer over the grade so that the double arrow icon appears. 3. Click on the double arrow icon and choose View Grade Details. 4. Click on the Grade History tab to view the historical record of marks. 5. To view the complete history click on View Complete History. 6. You may view the Grade History for the whole course by accessing the Grade Centre and hovering over Reports and choosing View Grade History. 7. You will be presented with the history of grades within the Grade Centre. You may download the Grade History by clicking on the Download button.